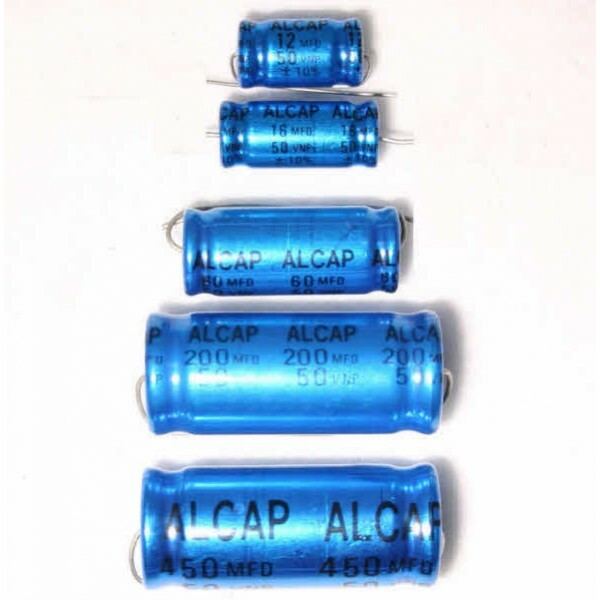 Alcap 120.00uF 50V DC Electrolytic Capacitor non-polarised Standard series from Falcon Acoustics, The Leading Supplier of DIY Hifi Components. Alcap 120.00uF 50V DC Electrolytic Capacitor non-polarised reversible Standard series for loudspeaker crossovers and networks, tolerances available, from Falcon Acoustics, the leading supplier of diy hifi components. Alcap 50VDC Electrolytic Capacitor non-polarised reversible series are designed for most general hi-fi loudspeaker crossover applications. 63V surge. Together with the Alcap 100V range they are very similar in sonic character and physical size to the black ELCAP capacitors used in the 1970/80’s by nearly all OEM loudspeaker manufacturers. Loss Factor D <0.10 @ 1kHz to 220uF, D <0.20 @ 1kHz > 220uF.